Download, print, and assemble your Colt (Mirage) with these translated papercraft instructions. Paper model building is a popular hobby in Japan that is currently gaining traction in America, especially in regard to papercraft cars. Manufacturers like Mitsubishi have catered in the past to a large papercraft fanbase, having provided dozens of free designs on their Japanese site. Just as the Colt was discontinued in favor of the Mirage, Mitsubishi discontinued the papercraft section of their site in 2010. Luckily, we here at The News Wheel know how to dig up lost and forgotten pages on the interwebs. 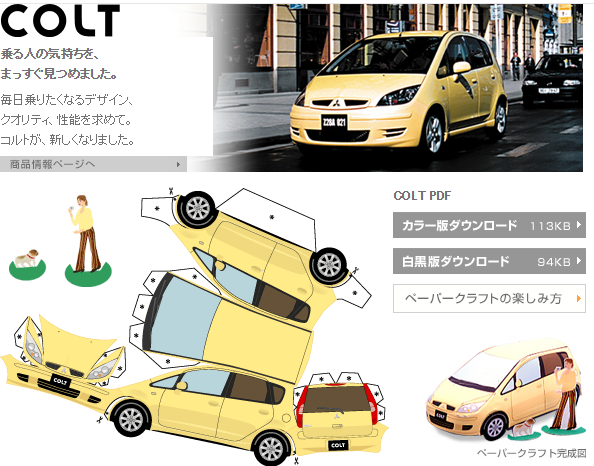 Here, we present the Mitsubishi Colt papercraft model originally offered by Mitsubishi on its Japanese site years ago. This papercraft model was designed by artist Mizurogi Akira, and this one even includes a shutterbug woman and her photogenic dog. That’s just what your office space needed! How did they know? 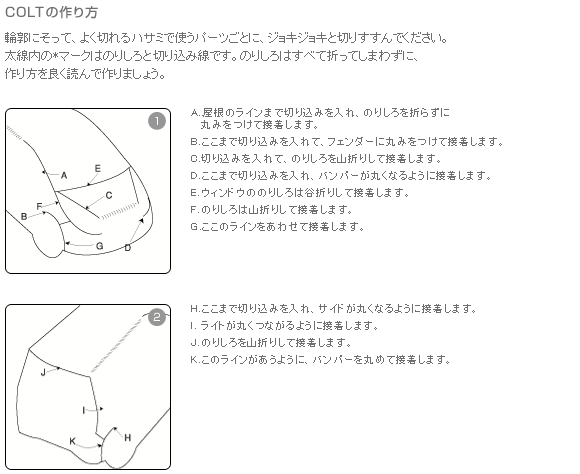 Here at The News Wheel, we not only recovered the printable Mitsubishi Colt PDF file, but we also went ahead and translated the Japanese instructions for you, too. 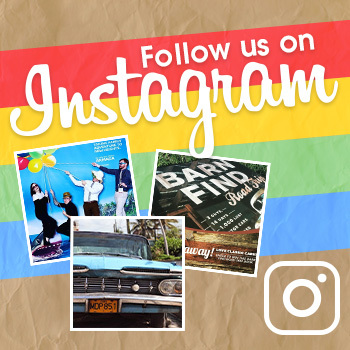 Don’t say we never gave you nothin’. A. Line up the side of the car with the edge of the roof line, glue in place. B. Cut all the way up this line around the wheel. C. Mountain fold the tabs and glue. D. Glue the edge here, then round out with a pencil to create the curve of the bumper. E. Valley-fold the tabs on the windshield and glue on the hood. F. Mountain fold these tabs, then glue. G. Mountain fold along the fender and glue the white area underneath the bumper. H. Cut up the line here. I. Glue lights to the back of the car, round out inside with a pencil. J. Mountain fold the tabs and adhere. K. Mountain-fold the edge of the wheel, then glue to the bumper. This is a simple build, but be sure to follow our papercraft car tips and tricks for best results. When you’re finished, just change the licence plate to say ‘Mirage’ and you’re all set!